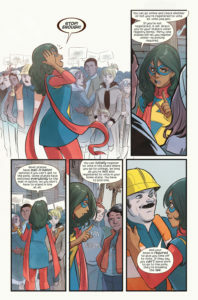 Graphic Novel Review 25/365: Ms. Marvel – Pull List Week! I hope you read my post yesterday about Miles Morales because today is a continuation of sorts featuring a comic book run that has continued to be a blast! Kamala Khan a.k.a. Ms. Marvel embiggened (you’ll get this when you read the book) her way onto the single issue scene in 2014. 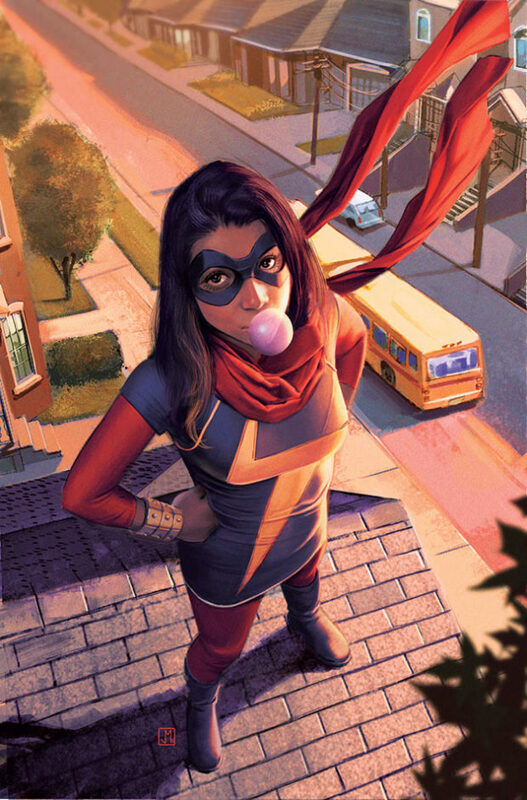 Written by G. Willow Wilson, Ms. Marvel is the first Muslim character to have their own book (for Marvel at least)! And while her cultural background plays a fairly large part in her story progression, what plays more is that she is a typical teenager. Just like Miles Morales, Kamala’s character is greatly affected by her home, school, and social life; fighting crime and keeping Jersey City safe is at times secondary to fighting her own personal problems. And in the mix of big Marvel event books, and epic hero killing hero action stories, Ms. Marvel never gets too heavy or daunting for the average comic book reader. If you are a non-hero book reader, no worries! You can pick up the first trade of Ms. Marvel and jump right in! Will you need to Google a thing or two over the stack of issues? Maybe, but it will never feel like a chore or lead to a rabbit hole of Marvel historical confusion. Which is why Ms. Marvel makes an amazing entry comic for students. Like the Miles Morales books, I have had Ms. Marvel readers tear through ALL of my Kamala Khan books, looking for more. The book is sharply written with believable dialogue, and the art has been consistently pleasing with bold colors and exaggerated character design, adding to the fun. Plus, Kamala Khan is a character that you root for. She’s kind, energetic, and hopeful: traits that we can all admire in these rough social times. If you are like me and run through all of the Ms. Marvel issues, you can find more of her in Marvel’s Champions, a newer title that also included Miles Morales, and she does appear in a few issues of Spider-Man…spoiler: Kamala and Miles are sort of into each other.